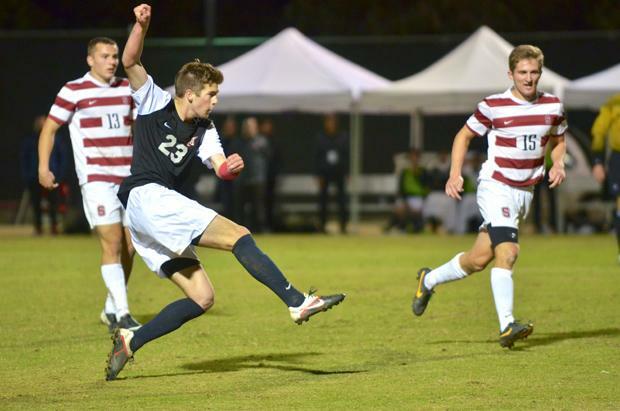 The Stanford Cardinal (10-6-4) left Northridge with a victory as they defeated the 15th seed Matadors (15-7-1) at Matador Soccer Field on Sunday night in the second round of the NCAA Tournament. The Cardinal would score the match’s lone goal in the first half, as Stanford defender Matt Taylor headed a free kick just past the arms of sophomore goalkeeper Adam Hobbs to find the back of the net in the 20th minute. The Matadors had scoring opportunities early but could not break through. Redshirt junior defender Tanner Snedigar headed a corner by senior forward Beto Velasquez too high and into the hands of Stanford goalkeeper Drew Hutchins in the fourth minute. Minutes later, redshirt sophomore midfielder David Turcios sent a shot low and wide of the net. The Matadors could not respond to the Cardinal goal as redshirt freshman Nicolas Camacho stroked a shot that sailed wide in the 28th minute and junior midfielder Marino Peixoto hit a corner which did not produce a shot on goal in the 38th minute. Although the teams would go scoreless in the second half, both teams picked up the pace with more shots on goal and more intense play. The Matadors dodged a bullet in the 50th minute, as Hobbs came out of the box to play a ball that quickly got away from him, leaving the net open for Stanford. 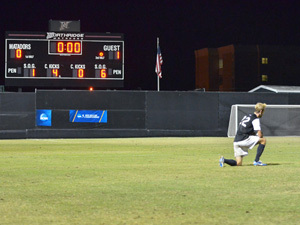 The Cardinal threatened but the Matador defense successfully cleared the ball to record a team save. The Matadors failed to connect on powerful shots by freshman midfielder Juan Samayoa and redshirt senior Chris Smith in the 60th and 61st minute in what would prove to be their best scoring opportunity until the end of the match. In the 87th minute, Hobbs came out from goal and boomed a shot from midfield that landed in Hutchin’s hands for his only save of the match. Stanford was able to clear the Matador attack and hang on for the victory. “When you get this opportunity it hurts real bad. The farther that you get in the NCAAs, the more pressure there is and the more it stings,” said coach Terry Davila. The Matadors played without redshirt junior Edwin Rivas, who was injured in the Big West Conference Tournament Final at UC Irvine last week and was unable to play in tonight’s match. Rivas was a key component of the Matador offense according to Davila. “The biggest game of the year we don’t have our big guy that pushes the ball forward that gives [Lev-Ari] chances so we had to adjust, and there was a lot of admirable performances,” said Davila. Davila felt that his team may not have been focused coming into the tournament match. 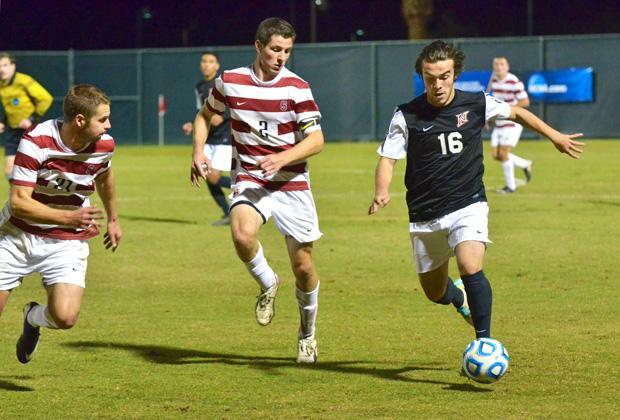 “I feel from a mental standpoint that’s where our university has to improve on our soccer program. I want players that want the ball in these situations so they can take our program over the top and I’m gonna make sure that happens,” said Davila. Junior forward Sagi Lev-Ari, the leading scorer in the NCAA coming into the tournament with 16 goals, took the loss in stride but was already looking forward to exceeding his performance next season. Lev-Ari also said what he would tell his teammates following the loss. “We need to put this behind us and put in the work to do better next year,” Lev-Ari said. Senior forward Brian Behrad was disappointed with the result but felt that the program made strides this season in rallying support around campus. “We’re starting to get our name out there. Students here, they’ve never really been too much into soccer, coming out to games, but it’s starting to change and it’s really looking up,” said Behrad. Despite a historic season in which the Matadors reached the top five and led the nation in points and assists per game, Davila pledged to do better in this situation next year. “We’re sad this year is over, and we do apologize to our fans and to our school for not getting this big game for us because we needed it as a university. 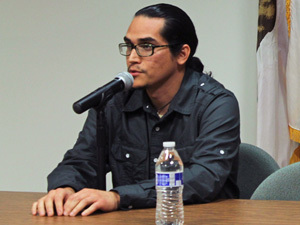 We’re gonna try harder next year to make it happen, and make this university proud,” Davila said.